Thousands of homes across the north and north-west were without power as wind and rain battered down. And last night, one of the main roads in Argyll remained closed after two cars were caught up in a landslide. The Met Office had a yellow “be aware” warning for heavy rain in place as 300 tonnes of debris was washed down the hillside at the Rest and Be Thankful. Ferries were also disrupted or cancelled up and down the west coast, while surface water and debris made driving conditions difficult for motorists across the Highlands. The Churchill Barriers in Orkney and Sea Road in Lerwick were also closed. The main A83 trunk road between Tarbet and Campbeltown was closed and with further flooding leaving the emergency route un-useable, a 50-mile diversion via the A82 was in place. Today, work to assess the condition of the slope at the Rest and Be Thankful will resume. Investigations will also be made into creating a local diversion along Old Military Road. 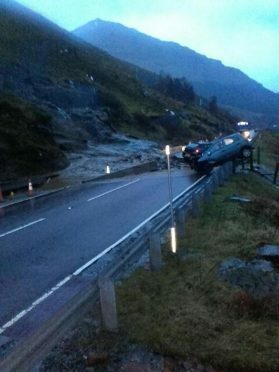 A spokeswoman for Bear Scotland said last night: “The A83 remains closed at the Rest and Be Thankful after approximately 200 to 300 tonnes of material was been washed down the hillside onto the carriageway this morning. “Approximately 71mm (2.8ins) of rain fell in the area overnight with a further 5mm in the afternoon causing debris to continue to flow down the slope. Two cars were caught in the wash-out and are currently being recovered but with no reported injuries. “The slip occurred just south of the B828 junction above the location of the December 5 slip. Geo-technical experts have estimated that the slip occurred some 200m (656ft) above the carriageway and at least 100m (328ft) above the location of the previous landslip on December 5. The A83 remains open from the B828 junction heading westbound towards Inveraray allowing access to Lochgoilhead, Dunoon and Western Ferries. One lane is open on the A835 Inverness to Ullapool road at Garve after teams cleared a landslip estimated at around 50 tonnes from the carriageway. Temporary traffic lights will remain in place for safety. Much of the road to the village of Balvicar south of Oban was under water at one point. And ferry passengers are also being warned to expect “significant disruption” to their travel plans.